He's crushed the S&P for 5 years running. And now one of America's most successful financial analysts finally reveals his secret. 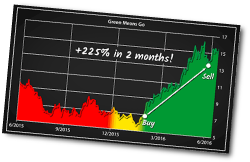 "NEVER invest in a stock unless it's inside my profits bullseye called…"
ALL in less than 90 days! “You have such an amazing system! It's more than paid back its cost in a couple months, and I haven't even been trading that much." – Brian S.
“I've been at this since 1984 and have NEVER made these kind of returns this quickly! Keep up the good work." – Chip W.
“I moved all my retirement to trade based on your recommendations. Just $17,000 more and I will have officially DOUBLED my retirement in a very short time. Keep up the good work." – Jim T.
"Adam, I have always been amazed how much my future has changed since following your investment advice. Win or lose I have seen my bottom line grow consistently over the past years.” – Joe C.